Embraced by unrivaled beauty, gorgeous landscapes and breathtaking scenery, Ireland is truly stunning. Ireland is a small country with a big reputation. Ireland, the island of 100,000 welcomes has one of the nicest country-sides and scenery you will see in any part of the world. Ireland is a unique country to visit with its lovely quaint villages, stunning beaches, rolling mountains and beautiful scenic walks and drives. It is small with a big reputation, helped along by a timeless, age-caressed landscape and fascinating, friendly people, whose lyrical nature may be witnessed in the warmth of their welcome. Ireland, the island of 100,000 welcomes has one of the nicest country-sides and most beautiful scenery you will see in any part of the world. Ireland is located on the north-west tip of Europe, surrounded by the Atlantic Ocean and the Irish Sea. It is the one place in the world where even 'getting lost' will be worthwhile... with its ancient myths and legends to discover, amazing landscapes to explore and locals who will be more than happy to reveal our hidden gems. Just go where the island of Ireland takes you, guaranteed, you will return home with memories that will last a lifetime. Irish cuisine is known for the high quality of its meats and the freshest of fish and shellfish. The most common of these would be Beef, Lamb and Bacon, Wild Salmon, Lobsters, mussels and oysters. Delicious local dishes such as Irish Stew and Bacon and Cabbage as well as fresh seafood and salads are widely available in pubs and restaurants. The Irish have also been accomplished cheese makers for centuries as well as Baker and stout makers (Guinness). The main talking point with every Irish person is the weather and to experience four seasons in one day is a common occurrence. The climate is mild with a temperature of around 10c. The coldest months are January and February, and during the summer they range from 16 to 24 degrees celsius. The warmest months are July and August with average temperature reaching 20c. One of the great benefits of travelling in Ireland during the Summer months is the 18 hours of daylight. These long evenings occur during June and July, and you will find that it doesn’t get dark till after 11 pm. It is not possible to predict the Irish weather as you may be sunning yourself in April and holding an umbrella in August! Ireland has so much to offer visitors. Get a fresh view of our rugged mountains, lakes and coastline with activities such as hill-walking, mountain climbing, hiking, biking, sea kayaking and angling. Or unleash your adventurous side with pursuits ranging from white-water paddling to wake boarding and sky diving to surfing. Ireland has something on offer for everyone. Set on an adventure such as “The Wild Atlantic Way” where the journey of a lifetime awaits you. There’s 2,500km of rugged coastline where you will pass through 9 different counties, numerous stopping points of attraction, breathtaking scenery and accommodation to match. Sports play a huge part in Irish culture with Gaelic Hurling and football being the countries national pass times. Golf would be the next most popular sport, and for a small country, it boasts some of the best Championships courses in the world. Visitors from far afield come to play at on some of the well known courses like Ballybunion, Adare, The K Club to mention a few. Rugby, soccer and athletics are high on very popular. Ireland also has some of the best racehorses and stud farms in the world. 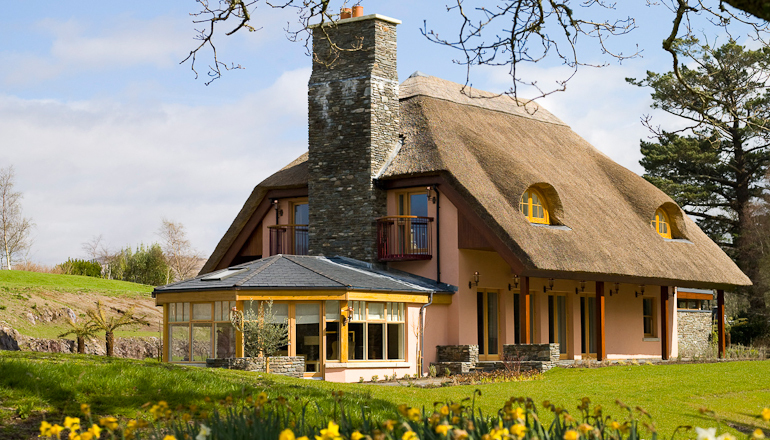 At Exceptional Villas, we have an impressive portfolio of luxury villas in Ireland at our fingers tips. These vary throughout the country from Castles in the countryside to luxury thatched roofed villas overlooking and cottages the Atlantic Ocean. Trust plays a huge part in our company’s ideology, and being the most trusted villa experts in the world, is the cornerstone of our business. This is why we spend a lot of time with each of our clients to ascertain their needs, requirements and dreams when helping them select their exceptional villas. We are very proud of our consistent 5-star reviews on Trust Pilot and Trip Advisor. We cater for every need so from the moment you pick up the phone or email us; we will guide you through the process and make sure that every detail of your vacation is perfect. Once you have booked, our complimentary concierge department will organise everything for you depending on your requirements. This can start with a VIP meet and greet at the airport, car hire, restaurant reservations, and advice on all the best things to do and see. If you are looking for rentals in Ireland, we would be delighted to assist in helping you find the perfect property. View our website to get more information on exceptional villas in Ireland or contact our team of villa experts to learn more about the wonderful Emerald Isle.